Joel Jezequel strongly believes it is essential to address the site of pathology directly, as well as to determine the etiology of a specific injury–whether it is the result of biomechanical faults or patterns of movement during rehabilitation. Joel advocates a marriage of quality research findings and clinical practice, taking into account individually tailored patient goals in order to create the perfect stage to provide optimal patient care. Joel earned his Doctor of Physical Therapy degree from Columbia University, where he studied in the advanced track for orthopedics. He completed clinical rotations at the Nicholas Institute for Sports Medicine and Athletic Trauma, as well as several other orthopedic and sports clinics. Prior to attending Columbia, Joel received his Bachelor of Science degree in Applied Health Science from Wheaton College in Illinois. Recently, Joel co-authored a systematic review in a special neurological issue of the American Journal of Occupational Therapy, titled “Systematic Review of the Effects of Exercise on Activities of Daily Living in People with Alzheimer’s Disease.” He also holds membership in the American Physical Therapy Association and the New York Physical Therapy Chapter, within the sports and orthopedics section memberships. Born in Costa Rica, Joel grew up in Miami, Florida, where he began playing competitive soccer at an early age. He gained numerous honors for soccer throughout high school and went on to play NCAA Division III soccer in college. Today, Joel continues to play soccer throughout New York’s extensive networks. He also enjoys both road and mountain biking, running and a global movement approach to exercise routines. Brittney Ravettine’s passion is to help patients reach the rehabilitative goals that are most important to them. She gets to know each and every person she works with to understand their motivation and personal history. Her treatment style effectively combines hands-­on manual skills and individualized therapeutic exercise to successfully treat her patients. Over the course of her career, Brittney has treated a wide range of patients—from Major League Baseball players during the rigors of spring training, to competitive wheelchair athletes in multiple sports. Having rehabilitated athletes as they push the limits of their bodies, she understands that preventing future injury is as important as returning from injury. Brittney received her Doctor of Physical Therapy degree from Columbia University, with a specialization in orthopedic rehabilitation. She also obtained a Certificate of Achievement in Vestibular Rehabilitation, earned from leading specialists in the field. This knowledge base allows Brittney to achieve greater recovery results by treating each individual patient from every possible angle. It has also helped her safely implement return­from­concussion programs with athletes. In her personal time, Brittney enjoys kettlebell training, biking, swimming, snowboarding, softball, and basketball. She is a current Certified Strength and Conditioning candidate. Sapana Kanojia strongly believes in the importance for individuals to be able to return to their desired functional and recreational lifestyle. 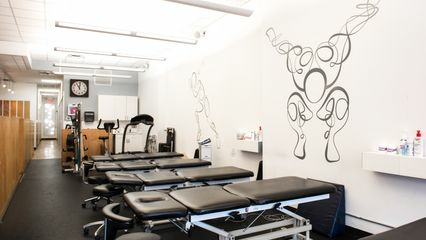 Her interest in treating injuries affecting artists, musicians and dancers has led to creative treatment options that address the musculoskeletal issues patients encounter due to their particular art form. She knows how passionate scholars and artists are about their calling, and strives to return to them to a fully functional and recreational lifestyle. Empowering patients through the promotion of exercise and wellness, she encourages them to live a more balanced life. Sapana earned her Master of Physical Therapy degree from the University of the Sciences in Philadelphia, and a Master of Public Administration in Health and Policy Management at NYU. Her commitment to serving the public with cutting-edge concepts, implemented with an interdisciplinary approach, increases the continuum of care she offers. Sapana has taken courses on manual therapy with a Canadian approach and has worked as a Clinical Instructor to numerous PT students at NYU. Sapana also spent a summer in Chiang Mai, Thailand, studying traditional Thai massage. In her spare time, Sapana enjoys running, biking, swimming and playing volleyball. Born in California and raised in the Philippines, Dustin Macolor comes to Orthology with an essential trait that makes him a great caregiver: he finds purpose in life by helping other people. Dustin also takes it another giant step. He places other people’s interests above his own. In a world of selfies and selfishness, “selfless” is refreshing. It restores your faith in humanity. It is also the key ingredient in restoring others to full function, physical wellness, and future health. Putting patients first is healthcare at its very best—and why Dustin is an Orthologist! Initially intending to be a medical doctor, he became inspired by the concept of rehabilitation during PT school. He witnessed first-hand how physical therapists bring renewed, real hope to patients by getting them back to doing the things they love. As Dustin simply says: “It’s my commitment to making a difference in other people’s lives. It’s what makes me feel contented, satisfied, and fulfilled at the end of the day.” He believes that what works best is getting to know patients, gaining their trust, and being part of their lives. A graduate of the University of Santo Tomas (BS Physical Therapy – Class of 2012) and Northeastern University (tDPT – current) Dustin is a runner, loves to read, and enjoys sports. He is a Certified Kinesio Taping Practitioner (CKTP). Ashely Houck loves dancing. She’s also a first rate violinist. A leader. Well-educated. Certified in sign language. She also happens to be a great caregiver and a wonderful new addition to Team Orthology! Ashely has successfully integrated her interest in the arts into the field of medicine. She found that physical therapy could really make a difference in the lives of artists, especially dancers. As she discovered early on, successful treatment can get these performers back to doing what they love. But she’s committed to helping everyone, caring for wide range of patients from diverse of cultural/socioeconomic backgrounds, physical limitations, and all ages. The rewards are many. Patient’s individual stories, lives, and goals inspire her, and she knows that helping people along their journey to a healthy lifestyle–making a difference in their lives–is a gift. As Ashely says, in her enthusiastic way: “We end up learning a lot from our patients, too!’ She has a Doctor of Physical Therapy degree from Touro College, and was honored with the Maimonides Award in Healthcare upon graduating. She has a Bachelor of Science degree in biological sciences from University of Pittsburgh, a minor in chemistry, and a certificate in American Sign Language. While an undergrad, she was Assistant Concert Master Violinist in the University Orchestra; a member of the prestigious Heinz Chapel Choir; performed with the UOP Dance Ensemble and Ballet Club; assisted with biological sciences research. Her lifelong involvement in the performing arts, namely dance, emanates from a strong ballet technique, awareness of body mechanics, and musicality. She founded a dance club at Touro College, and was active in the Student Physical Therapy Association A self-described “newbie” at Orthology, her passion and success as a caregiver has made her fit right in! Laurie Hutt likes to keep moving. Whether playing sports—basketball is her favorite—or being outdoors in the fresh air and bright sunshine, she’s on the go. As you would guess, she loves traveling, too! And professionally, she knows how crucial movement is to successful physical therapy. There are long term health benefits that come from incorporating movement into your everyday activities. It all adds up. Taking the stairs instead of the elevator. Walking to pick up food instead of having it delivered. Parking farther away from an entrance. Conscious living, right? It helps to have someone to motivate you, to keep you moving and living smarter, and Laurie really enjoys encouraging people to achieve their goals. She’s focused on helping others, and truly empowers her patients, showing them a path forward during treatment—sometimes with a gentle, genial nudge. She says it best: “Sometimes people just need that little extra push and a different perspective to recognize that they can do it!” Being active comes naturally to her! And that passion translates to her profession perfectly. She enables patients to return to an active lifestyle and have fun doing it. Her quest is to make a difference in people’s lives. As Laurie says herself, she strives to have patients “actualize their potential, while incorporating a healthier and more active mindset into everyday life.” The payoff is watching the people she treats improve– and fully recognize that if they just keep moving they can enjoy lasting health, pain-free and doing what they love. A graduate of Binghamton University and Rutgers University (Legacy UMDNJ), Laurie is certified LSVT BIG for improved function in patients with Parkinson’s Disease. Elizabeth Melvin is a welcome new addition to the Orthology team! Born in Ireland, she received her degree in Physiotherapy from historic Trinity College University of Dublin in 2011. She was awarded a full scholarship for academic excellence in her field. A superb athlete herself–mostly gymnastics and track–Elizabeth went on to receive her Master’s Degree in Sports and Exercise Medicine the following year. During her graduate studies, she also worked professionally, conducting a research study investigating the reliability of the BodyMetrix ultrasound machine for the assessment of body fat percentage in female collegiate athletes. She’s always been drawn to the world of sports. Elizabeth has extensive experience working with athletes of all ages and abilities, including the Irish International Women’s field hockey team, rugby teams at all levels, and gymnasts performing at the national level. Plus, she loves Gaelic games, including hurling and Gaelic football, an action-packed sport that combines elements of soccer, basketball and rugby. It’s “brilliant,” as the Irish like to say! A qualified gymnastics judge and coach with over 11 years of experience, Elizabeth is also an Anatomy Specialist, having spent a year as a demonstrator teaching undergraduate and master’s level students at her alma mater in Dublin. In addition, she’s a certified Pilates instructor, and likes to combine it with her gymnastics and anatomy expertise to focus on re-establishing correct form during both static posture and exercise. She further incorporates her knowledge of statistics and research experience to ensure her patients always receive up-to-date, evidence based treatments. Elizabeth has been a Manhattan resident for 3 years with experience treating a wide range of pre/post-surgical and orthopedic issues, and specific sports-related injuries. She is a member of the American Physical Therapy Association, holding sports and orthopedics section memberships. Like many providers on the Orthology team, Matthew Burns discovered his passion for caregiving after suffering athletic injuries himself. He discovered the profound effect that physical therapy has on an athlete’s recovery, and how it can create a path to life-long health. And he also discovered that the label of “athlete” is not limited to people that play sports. In fact, he likes to quote the great track &amp; field coach Bill Bowerman, co-founder of Nike: “If you have a body, you are an athlete.” Before earning his Doctorate of Physical Therapy from Sacred Heart University, Matthew graduated from the University of Connecticut with a Bachelor of Science degree in Kinesiology and a minor in Nutrition for Sport and Exercise. During his time at UConn, he was also a 4-year member of the Division I Men’s Varsity Tennis team. His top-level experience as a collegiate athlete helped ignite his passion for the field of physical therapy. In his practice, Matthew develops a specific plan of care for each individual, with a clear understanding that every injury is unique. With a strong emphasis on manual therapy, he employs corrective exercises for a well-rounded treatment approach. Working with a wide variety of patients, treating a range of orthopedic concerns and sports related injuries, Matthew utilizes the most effective, research-based techniques to help patients achieve their goals—to empower them to return to their lives and enjoy great health in the future. Jessica Chang brings an extraordinary depth of experience to Orthology, working with all types of people with active lifestyles, from weekend warriors to SoulCycle instructors to Olympic gold medalists. She fits right in! Clearly, she brings a lot to the table: wide-ranging therapeutic skills, coaching ability, and a record of success treating high-level athletes. She translates these professional experiences into treatment, and gets her patients to their highest level of functioning. Even with all her accomplishments, she’s never lost the genuine excitement of being part of a person’s journey to getting the most out of life, whether it is finishing that next marathon or playing with your toddler. Originally from beautiful San Diego, she’s Ivy League, educated at Columbia University. She’s all about soccer—listing the great Abby Wambach as her all-time favorite athlete. She’s also pursued some more exotic activities, including acroyoga, a challenging pursuit that combines yoga and acrobatics. Jessica also loves circus acrobatics, which seems exotic enough! What makes Jessica so special and such a perfect addition to Team Orthology is one piece of healthy advice she has patients: “Sometimes, eating a donut is the most healthy thing you can do for yourself.” This hands-on practitioner knows when it’s time to let go a little. A highly educated professional with great treatment outcomes, and a sense of humor? Orthology is lucky to have her aboard. By the way, she’s partial to chocolate croissants herself. Jessica is a certified EXOS Performance Specialist (XPS) trained in strength and conditioning methodology specifically developed for professional athletes, especially NFL football. There’s a simple aphorism that many physical therapists share with their patients: “Motion is lotion.” Often used in the context of arthritic pain, it’s generally sound advice. And it’s a good course of action during treatment for musculoskeletal injuries and issues. As some wit once observed, we all have a bit of the “Tin Man” in us as we age. A sedentary lifestyle tends to make us creak & squeak. “To rest is to rust,” so to speak. Basically, activity, movement, targeted exercise and manipulation get a fully-functioning body to secrete the proper amount of natural lubricants that make your joints feel better. And this is where Max Lai comes in. When it comes to being in motion, he’s a believer—and practitioner! He came to his career choice pretty easily. He loves to meet people, and especially loves to help them get better. Friends and family describe him as loving person. So caregiving–listening to a patient’s needs, goals, and future hopes– comes naturally to Max. After all, some people are just born empaths. Helping others return to active lives, improving their quality of life, to enjoy pain-free good health, is who they are. Taking care of others is just what they do. Max is originally from Florida, so we suspect the nice climate had a salubrious effect on him! It certainly made him an active guy. He loves to dance, and play basketball and tennis, too. He went to school at the University of St. Augustine, the well-known health sciences college, and counts the gifted, yet supremely hard-working Dwyane Wade as his favorite athlete. And whenever Max is not on the move, or doing the work he loves, he will occasionally sit down long enough to watch Netflix. But don’t count on him resting too long! This is a man in motion–a man making lotion! Brando Lakes is from the small desert town of Joshua Tree, California. “Yes, people are from there!” He decided to become a physical therapist at a young age. After his mother suffered a terrible ankle injury during his senior year of high school, she underwent a transformative rehabilitation in PT–from couch potato to fitness junkie. Amazed by the power of treatment to help create healthy lifestyle changes, Brandon was all in. “I learned very early on that physical therapy isn’t about just getting someone back on their feet, or to their prior level of function. It’s about getting them past that . . . I want my clients to overcome obstacles or behaviors that prevent them from becoming a stronger, healthier version of themselves.” While attending California State University of East Bay, Brando worked closely with Athletic Trainers on the Sports Medicine Team, was involved in research with graduate students and professors, and gained invaluable experience in pediatric and aquatic therapy. He then came to New York to earn his Doctor of Physical Therapy degree from Columbia University. Brando completed an Advanced Neurorehabilitation Track while there, and has been certified as a Strength and Conditioning Specialist, buttressing his ability to treat a wide-range of neuromuscular and musculoskeletal impairments. “My goal for each patient is to provide them with control over their pain and lifestyle.” Brando is not only an expert in his field, but also an accomplished writer and painter. A sports enthusiast, he loves football, basketball, soccer, softball, hiking and swimming. Known by friends and family as a calming influence, it’s worth noting that he’s relatively unplugged: “I don’t do the internet.” No wonder this small town guy puts people at ease!